The overall concept needed to support Novo Nordisk as a company and the different business areas as well as product brands. In addition, it had to express and reflect the spirit and values of Novo Nordisk and have the opportunity and capacity to be repurposed for a minimum of 3 years. The overall impression of the exhibit was to be based on Scandinavian design. The design has to be State-of-the-Art and demonstrate innovation - and be compliant with the Novo Nordisk visual identity. The design has to reflect the Novo Nordisk ambition to attract, engage and interact with. It had to have various touch points between branded and corporate areas at the booth. 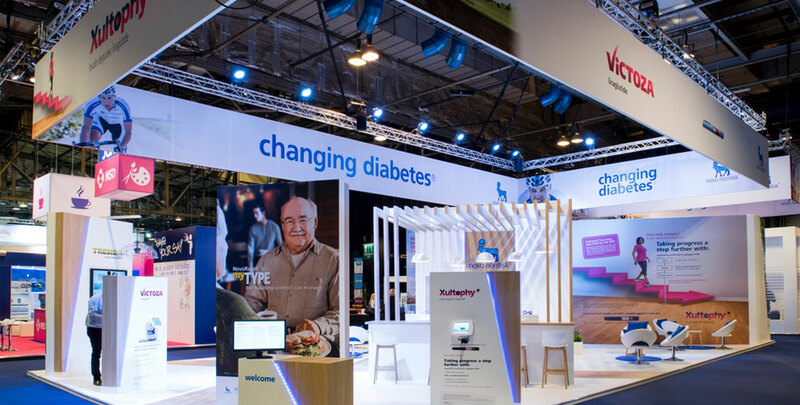 The Pb proposal offered Novo Nordisk a flexible, creative and effective exhibition stand concept for large and small exhibitions. PB proposed and provided a contemporary design that reflected Novo Nordisk’s values. Included were attractive features to attract the target audience, promote footfall and enhance the visitors’ experience. The design was also versatile and reconfigurable for additional future events where a presence was required.